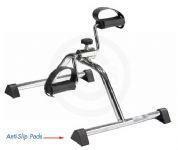 Exercise Peddler: Ideal for toning leg and arm muscles and is a safe and gentle form of low-impact exercise. 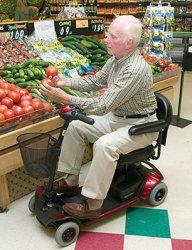 It is compact for easy storage and transport. Tension can be adjusted. It features a soft grip for comfort, pocket for handy storage and straps for added safety. This sturdily constructed bar offers quick and easy tool-free assembly. Includes a nylon bag for storage. Go-Go Elite Traveller: Looking to enhance your travel experience? Look no further than the Go-Go Elite Traveller! It offers unbeatable ease of transport, tight space maneuverability, and the versatility to change your color style in a snap. The Go-Go Elite Traveller's compact size allows it to negotiate narrow hallways and tight spaces while also providing stable outdoor performance. Take the guesswork out of travel with ultra-simple assembly/disassembly and impressive performance. Go where you want to go, easily, with the Go-Go Elite Traveller. SPRY Knee Cruzer Basic: NEW! The SPRY Knee Cruzer Basic is built with the same pedigree as the Elite but without the extra features. This fixed rear wheel design is now available at a price that would make anyone smile.